Tom Hanks, Elton John and Phil Collins have them and Rod Stewart reportedly hires whole hotel rooms when on tour to play with them. Yep, model railways are a hugely popular hobby for children and adults. But how do they work? Model trains — such as those by Hornby in the UK and Lionell in America — are miniature engineering marvels. Shrunken versions of trains of yesteryear and incarnations of the passenger and freight towing monsters seen on modern railways. Of course, the small models found in homes across the country don’t have the same steam and diesel motors of the real thing. No. Instead, Hornby and similar model trains feature a tiny DC motor. The DC motor turns a shaft which in turn rotates a screw (as in the animation below) which is aligned with a cog as in the animation below. An axel to drive wheels passes through the cog — the lower wheel in the animation. The motor turns the top screw, this turns a gear at right angles which rotates an axel turning the wheels of the train. The end result is that when the motor operates the screw spins, turning the cog and in turn the wheels. The wheels of course sit on the rails and when they turn the train moves. But where does the power for the motor come from? This is the fundamental difference between electric model trains and the children’s battery driven variety. On model railways, electricity comes from the household supply and is connected to the rails by wires with clips that attach to the underside of the track or are soldered on. When the train is placed on the rails, electricity flows through the rails to the wheels. Wires attached to contacts resting on the wheels then carry the electricity to a motor inside the train giving it the power to operate. All these gears, wires and the motor, seen in the picture to the left, are hidden inside the shell of the train. Over the years, the quality of this outer shell has improved with more and more detail added as manufacturing techniques improve to the point today where model trains are almost perfect replicas of their bigger brothers and sisters. As we’ve seen, the electricity supply is carried from the rails to the motor and which then turns the drive shaft and the wheels to move the train. Speed and direction control — forward or reverse — depends on the technology used. Traditionally, model trains used a simple Direct Current system as used by most electrical items in a UK home. The more power fed to the engine the faster it goes. Changing direction was simply a matter of changing the polarity of the supply. With both the polarity and speed being controlled from by a simple switch and dial on the railway controller that sits between the power socket on the wall and the connections to the track. Although simple this does have the problem that all trains on track fed from a controller go at the same speed and direction. More recently, digital control — known as DCC in model railways — has improved things. For DCC, the power to the motor is still supplied via the rails but it’s at a constant level with the direction and speed for each loco transmitted as digital signals within the electrical signals flowing around the track. Each DCC loco has a mini computer inside onboard that listens for particular messages for it and controls the motor according to the instructions. The messages are set by a controller allowing the operator able to control each locomotive individually. That’s how the trains and power work but what about the track? 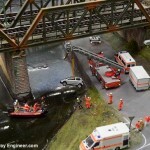 Model train track works in almost exactly the same way as real railway track. Two metal rails sit on sleepers. The sleepers hold the rails a precise distance apart so the wheels of the trains sit on them. This distance between the rails, known as gauge, is a key aspect of model railways as it defines what size trains work with what size track. An OO gauge train such as those from Hornby, for example, will only work on OO gauge track. In this case, OO equates to a distance between the rails of 16.5mm. 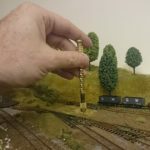 Other popular gauges are N gauge where the rails are 9mm apart, O gauge which has 32mm gap between the rails and HO which is the same as OO with track rails 16.5mm apart. The wheels have a lip, called a flange, on the inside edge so once placed on the track they won’t slip off. 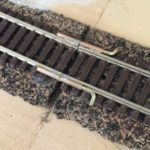 In model railways, the track is supplied in sections which are held together with ‘joiners’, slips of metal that fit over the ends of two rails which are then pushed together. The joiner holds the sections together. When assembling model railways sliding the rails into these joiners so the ends of each rail line up correctly is one of the most fiddly aspects and can often take some time but it is vital to get right as any gaps or misaligned rails can cause the trains to derail and interrupt the supply of electricity from one rail to the next. 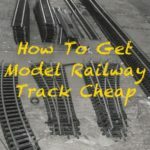 Beginners railway starter sets usually have enough track to make an oval circuit for the trains to continuously run around and further track expansion packs can be bought to make the railway larger. To this points can also be added allowing the track can fork allowing the train to move one section to another. The track must be on flat surfaces as any dips or humps will cause the trains to come off the rails. For starters, these surfaces are often usually a table or floor but as the layout advances in complexity and size, dedicated baseboards are usually built. For more interest slopping runs can be added so the trains can rise up or drop below or even over other track (using bridges) and hills with tunnels constructed. The exact plan track runs to can be based on real railways or a completely imaginary circuit, just depending on the space available. 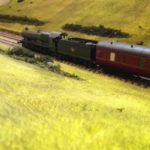 That’s one of the delights of making a model railway, they can be incredibly lifelike recreations of real-world locations or completely made-up locations and to both, you can then add landscapes, scenery, buildings all while learning new skills as you go. And once they’ve been made, you can then run trains as you want, even operating your trains to your own timetables, just like the real thing. It’s no wonder people from all walks of life, even rock stars, love them!